There are many types of fishing for anglers to enjoy. Mountain lakes and streams provide some of the best trout fishing on the planet, and warmer fresh water environments regularly lure some of the world’s best bass fisherman. However, for those fisherman looking for a lot of variety—for those who want to be relatively surprised every time their fishing rod jerks and dips with anticipation, there is nothing on the globe more exciting than deep sea fishing. 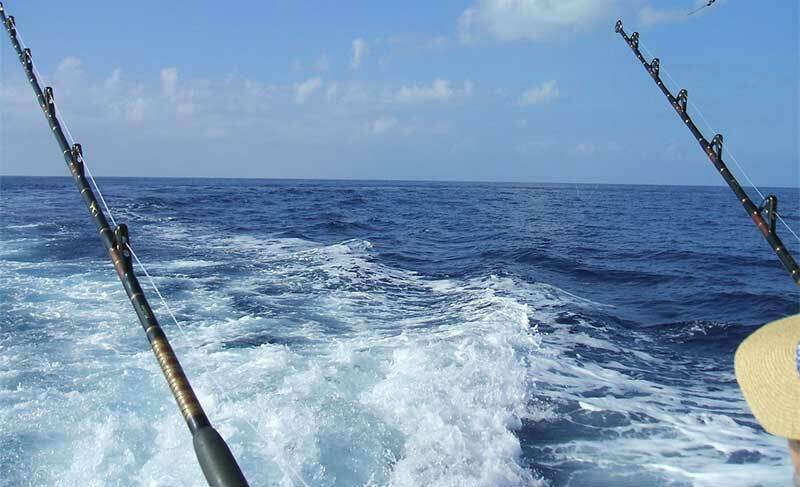 Deep sea fishing offers angling opportunities that are not found in other fishing environments. From deep sea bass and snapper, to halibut and tuna, to swordfish and even sharks, every cast into the salty waters of the Atlantic, Pacific or some other ocean offers a wealth of opportunity, variety and excitement. To help you make the most of these opportunities, below we have outlined and explained several helpful deep sea fishing tips for beginners—tips that can help you locate, hook and land some of the most tasty and hard-fighting fish in the sea. When you are preparing to set out on a deep sea fishing adventure, it pays to be prepared. To help ensure you have everything you need, below we have outlined some of the tackle and extras you will need for a great day of deep sea fishing. The variety of fish species you are exposed to when deep sea angling is virtually limitless. For this reason, it is important that you have all the tackle you need to hook some of these ocean trophies. Here is an example of what you should bring. Deep Sea Rod. A 6 foot to 7 foot medium action rod is usually very suitable for a wide variety of fish. Reel. When deep sea fishing, the best type of reel is an ocean baitcaster reel with a high line capacity. Line. For most species, 20-pound test monofilament line is the best way to go, although in certain situations braided line is more appropriate. Be sure to spool at least 100 feet or more of line on your reel. Leader. You should always have on hand at least 6-12 feet of 40 to 80-pound test monofilament leader for larger species. Baits. If you are renting a charter boat, chances are they will have a fully-stocked live bait well with sardines, minnows and other species used for bait. Hooks. Size 5 to 7 straight, barbed hooks are ideal for live bait fishing in the ocean. Weights. A variety of weights, from split shots to heavy weights for bottom fishing, should always be in your tackle box. Deep sea lures. If live bait fishing is not your thing, it is beneficial to carry a variety of deep sea lures that look and act like the real thing. Pliers. These are needed to extricate the fish you catch from the hook. Knife. A good fishing knife has many uses aboard a deep sea fishing charter. Stringer or gunny sack. A stringer or gunny sack makes carrying the fish you caught a lot easier and trouble-free. The weather/climate aboard a deep sea fishing vessel can vary from one minute to the next. From the early morning chill to the heat of midday to the cold winds at dusk, the weather conditions can make you miserable if you are not aptly prepared. A change of dry clothes. If it rains during part of your deep sea fishing excursion you will be glad you have a change of dry clothes. Long-sleeved shirt or a light jacket. These items can help protect you from prolonged sun exposure or keep you warm when the weather turns cold. Rubber-soled shoes. It can be very slippery aboard the deck of a deep sea fishing vessel. Therefore, rubber-soled shoes are a must. Gloves. Certain variety of fish should not be handled with your bare hands. Additionally, the gloves will come in handy in the morning when the weather is cold. Baseball cap. To keep the sun out of your eyes. Polarized sunglasses. The sun can be very bright when it’s reflected off the water, and polarized sunglasses can protect your eyes from UV light and glare. Sunblock. Sunburns can happen after just 20 minutes of exposure, so sunblock cream or spray is another must. Sea-sickness pills or a patch. A patch or Dramamine can help guard against sea sickness, as can the medication Cinnarizine, one of the few over-the-counter medications for motion sickness. Chapstick. Wind-burned lips can happen quickly when aboard a deep sea boat. Food and drinks. Many charter boats will have a galley that sells food and cold drinks, but if not you will have to bring a cooler that is stocked with your own provisions. When angling on a fishing charter boat there are many things you can do to be successful in your quest for hard-fighting and tasty fish. The first of these is to always listen carefully to the advice of the captain and the people that staff the boat. These individuals are the experts, and their goal, of course, is for you to catch a lot of fish. The staff regularly offers recommendations on the type of tackle and bait you should use based on the surroundings, so follow their advice if you want to be truly successful. Before you head out on your deep sea fishing adventure, it is imperative that you research the water in which you will be fishing. By studying the area and doing some in depth research you can familiarize yourself with the area, while also learning about the type of fish you are most likely to encounter there. You can also become knowledgeable on the prevailing weather and climate conditions in that area (which will help you dress accordingly), and some of the best places in which to catch fish. Talk to locals and other fisherman before heading out on the water and your chances of catching fish will improve dramatically. Seasickness is real, and even though you may think you have a cast iron stomach, rough waves and tides can quickly turn any person into a green and spinning mess. In other words, your much-anticipated offshore fishing adventure can quickly turn sour if you get seasick just as you are about to get things started. If you know you are prone to seasickness, be sure to take the necessary medication before the fishing trip. And even though you may not think you’re prone to seasickness, it pays to have some medication on hand just in case. If you still get seasick after taking the appropriate preventative measures, do not go below deck. Instead, you should go above to the deck of the boat and keep your eyes on the horizon. The fresh air from being on deck will help soothe you, while the steadiness of the horizon will help take your mind—and your stomach—off the rocking motion of the boat. Try to avoid sitting next to the vessel’s engine, too, as these fumes can only add to the queasy feeling you are experiencing. When fishing offshore, you will definitely need to have the right type of bait for every situation. Fortunately, both live bait and artificial lures can work very well when deep sea fishing. Some of the bait you might want to stock up on before you head out to fish includes shrimp, mackerel, minnows, sardines, and squid. Believe it or not, artificial crab bait also works very well when fishing during the nighttime, especially during a full moon phase. According to experts, “during a full moon phase, crab are known to shed, thereby attracting predators, such as deep sea bass and others.” Because of this, fishing with artificial crab meat can lure big fish to your area. Last but not least, while it’s true that some deep sea fishing spots will produce non-stop action, it may take you a while to get skilled enough to locate these areas. Thus, you will need to exercise a lot of patience when just starting out. Do not get discouraged though, because right when you think you should pack it up for the day due to a lack of action, your bait just might get bit by that trophy fish you’ve been dreaming about.